Hah! You thought I was talking about a presidential candidate, didn't you? Well, this once you were wrong. Today we are talking Jamaican jerk seasoning, one of my new favorite spice blends I use when grilling meats, poultry, and fish. I have never been to Jamaica. However, I did watch Cool Runnings, the movie about the Jamaican Bobsled Team that competed at the 1988 Winter Olympics. That counts for something, doesn't it? Markipedia did actually go to Jamaica and returned loving the food with its complex spice and heat. Back home, he’d wistfully cook from his souvenir cookbook on winter nights. And, really, it didn't take much to sway me to try a new cuisine. Of course, there are many jerk seasoning mixtures available in stores everywhere. But, that's not for me. Aside from the dreaded G, which is prevalent in jerk seasoning, I just think everyone should make their own spice blends. Buying them is fine, I guess, but then you are stuck with someone else's taste in seasoning. What if, let's say, you like it HOT! And what if Mr. Jerk Season likes it mild? 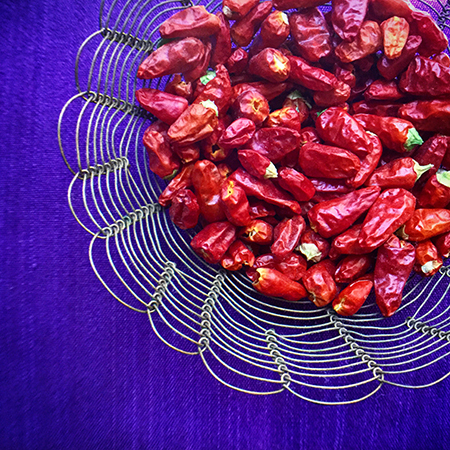 You end up adding more cayenne or a couple of Scotch bonnets until you are happy with it. Or, what if it is all heat but dull? Now, if you made it yourself in the beginning, you'd have the perfect mixture for you! This is a good time to note that, when using a dry rub, the longer you marinate, the more the flavors permeate the meat. Especially the salt! Keep this in mind when putting together your mixture; adjust the salt - and the other ingredients - for your personal taste. And, guess what? If you don't have all the spices, make a substitution or simply leave it out. Remember, each chef, each home cook, has her or his own recipe. Some of the more prevalent flavors that make an iconic jerk seasoning jerky are dried Scotch bonnet chiles, and allspice from the West Indies (a.k.a. the Caribbean), and ginger, nutmeg, cloves, and cinnamon from the East Indies. The presence of thyme differentiates it from rubs of other traditions, and reminds us of the British influence in Jamaica. At this point, I want to recognize Penzeys Spices (no, they didn't give me any spices, and they certainly didn't ask me to say this, although I do buy a lot of their spices). Not only do they have amazing spices, they have great social responsibility. They want you - yes, you cooks of America - to think about things. Social issues. 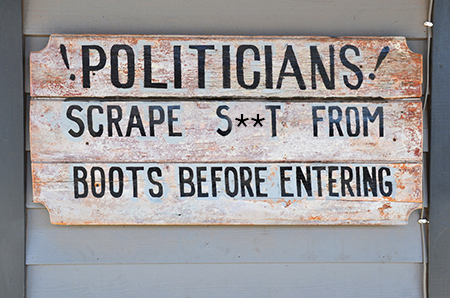 Politics. Economics. Kindness. 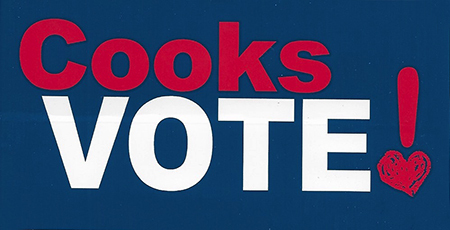 Recently, they put out this bumper sticker, and I hope you will all get out there on November 8 to vote. And vote thoughtfully. Back to the recipe: don't be a jerk. 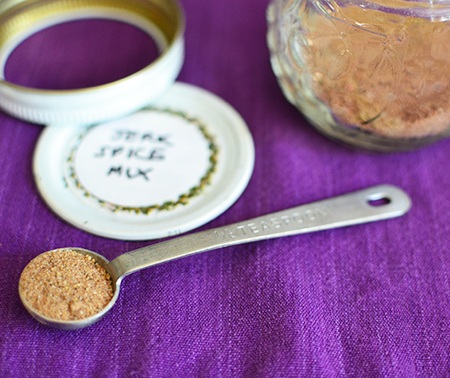 Make your own spice blends. 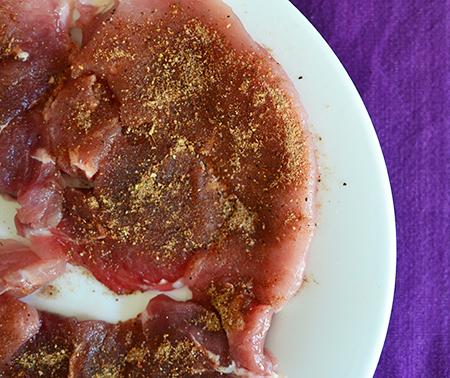 Sprinkle each side of the pork chops with 1/2 teaspoon of the jerk seasoning. Rub it in evenly, and place on a plate, cover, and refrigerate for 45 minutes to 1 hour. Heat a charcoal or gas grill to medium high. When fire is ready and marinating time is done, drizzle both sides of each chop with olive oil and brush in. Grill for 1-2 minutes per side. Serve immediately. It is good “as is,” or you can add a mango or fresh fruit salsa on the side. 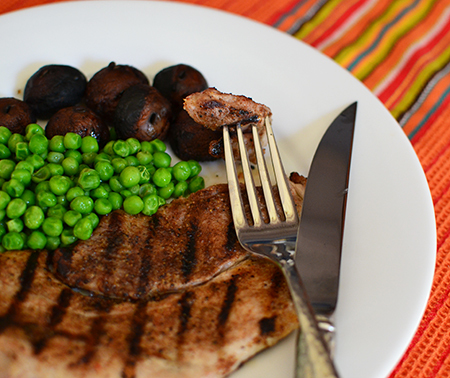 I served it with grilled mushrooms and peas cooked in rum. Combine all ingredients in a spice grinder and process until well-mixed. Store in an airtight container. I love this, because I just discovered last year that I LOVE jerk! Oh you simply must go to Jamaica to taste the jerk there, as you know that although we can get close to the original recipes at home, it's the atmosphere and having the dish in its own home that makes it simply phenomenal! I've never tried jerk pork, but will have to give it a try! Food always tastes best (and the wines and beers) when you have them in situ. However, Jamaica isn't high on our list for upcoming travel (Italy keeps getting in the way!) so I will have to make do with my rub. Oh, how tasty David! I have never tried jerk, but it sure sounds good. I think you and Peter will like this, Liz - and it works well with your new healthy lifestyle! Okay, now I love Penzeys Spices even more! How fantastic! Love the recipe, too -- and of course as always your prep shots! Sometimes, Penzeys does the most amazing things to celebrate all that is good in our world - our teachers, the women on our lives, democracy, and so on. I just love the company! I love Penzey's too. I used to be more of a purist, like I made my own curry and chili powders. But thanks to them sending little samples of some of their blends, I now own quite a few spice/herb mixtures. I guess I'm relaxing in my old age... Love your jerk!!! For me, I never have a choice because people who put together spice blends tend not to be judicious in what they use... as in, they always have garlic no matter what. Even if I weren't allergic, I would choose different combinations just so that everything didn't taste exactly the same. And, I do find that it's nice to make my own mark on a blend. Your brothers rib rub sounds wonderful. Having had many conversations with farmers who grow both organic (because of the demand) and non-organic, I have decided that I am okay with both organic and non-organic. Marcelle - I think you will love making your own. And, honestly, I didn't mean to criticize anyone who uses commercial blends - sometimes it is the only way! Unfortunately, I can't so making my own became fun and more personal! For some reason I have been missing your postings. I love this one and will make the Jerk seasoning for sure. 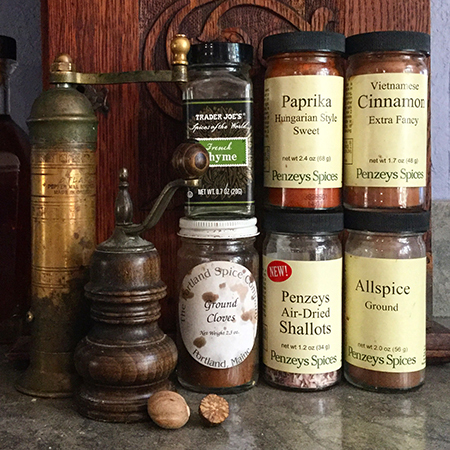 I also use Penzeys spices. Gerlinde - I hope that your email didn't somehow get deleted from my email list! Glad you like this! Hi David, I don't think I have ever had any dish with jerk seasoning, ever. Sounds delicious. Would love to try this. We have a Penzeys close to us and I love how fresh their spices are. Most jerk seasoning is REALLY hot, Cheri - so making the mixture oneself gives you a chance to make it perfect for your taste. 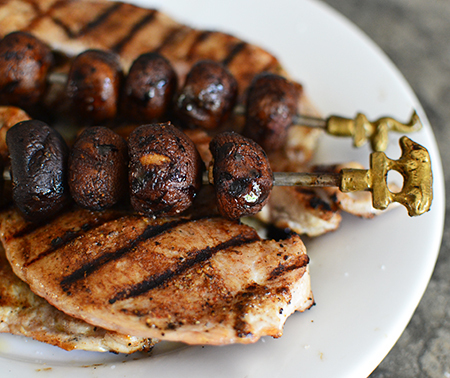 We LOVE jerk seasoning on anything, but definitely chicken is a favourite. You have inspired me for a spicy week. 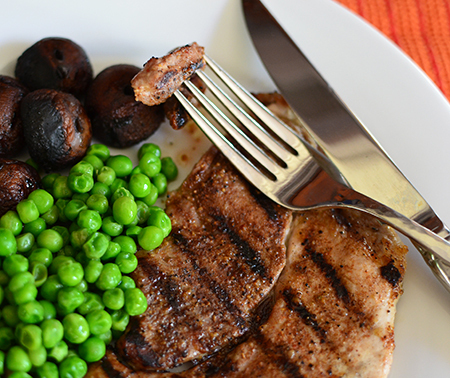 We usually make it with chicken, too, Carolyne - but we had these beautiful pork chops and it worked beautifully! I've been to Jamaica and their jerk dishes can be extremely spicy but oh so good. I know I would enjoy your pork chops. I think you would enjoy these, too, Karen! And they are a lot less hot than the real thing! Until I read the comments here I was going to tease you about the "dreaded G." I was going to say "Do you mean glyphosate or gluten?" One might wish to avoid those things too, especially the nasty herbicide that is on almost everything we eat now. Of course, now I know you meant garlic. I can't imagine being allergic to that essential element! Sorry for you. Now, please permit me to tell a different story. Because my dear hubby ALMOST had a (probably fatal) heart attack last December, we now are eating only plant based. Shocking, I know. We are committed to eating "vegan" for maybe forever. Doing this has cut his cholesterol number by half and he has lost 25 lbs, resulting in better health and way lower blood pressure. I want to have his company for as long as possible so giving up meat and dairy is an easy sacrifice. He had a stent placed in the LADA, the artery called the "widowmaker," shudder, no bypass, luckily. He goes to cardiac rehab every week and walks every day.This is getting too wordy, I know. Anyway, we now have become annoying fonts of information on "How Not To Die," the essential book by Dr. Michael Greger. Millions of Americans are in danger of shortened lives because of the SAD, standard American diet. Check out his website at www.nutritionfacts.org. It will shock you and change your life, and maybe save it. I don't mean yours personally, you understand, unless you also have high cholesterol and/or high blood pressure, Please forgive my rant, David, I want everyone to be safe and live happy, healthy lives. Both hubby and I now have a responsibility to tell anyone who will listen about heart disease. We don't think doctors stress it strongly enough to their patients. Anyone, even younger women and men could have plaque building up in their arteries waiting to destroy their health and chance for a long life. Caterina - no worries about your "rant." People really need to be vigilant about their health issues, and keep in touch regularly with their physician. I am so glad for you that you got this taken care of for your hubby before it was too late. Thanks for your thanks. I still read your blog every Sunday and still sometimes "cheat" and eat a little meat or cheese. But, of course, I am not the one with heart disease. Even so, as my hubby says, "It's not a religion," and even though he is very vigilant about what he puts in his mouth but will, not often, eat something that is not plant based. I am going to make your corn chowder today since hubby discovered in our freezer some whole ears of corn he froze last summer. I know how to adjust recipes so they are "heart healthy." Thanks for being understanding. We just want as many people as possible to be aware of heart disease. Nobody wants to have a nasty scare like we did! I'm all for DIY spice mixes, but you already knew that. Although I do cheat sometimes! The first time I had jerk was in Belize, many years ago. Nearly blew my head off! I wish I could cheat, John - there is dried garlic in everything! Mark loved Belize - I have never been, but it is on the list! But I do love jerk seasoning. I will definitely make this homemade seasoning and try it on chicken. On another note, I read something not so nice about Penzeys, just today. I will tag you on the post on FB so you can check it out. Interesting note from Penzey... He is certainly a quirky guy, but I can't pass judgement till I know more. At least he replied, which is more than most companies do. Still, his wording was a bit weird and harsh. David, this is wonderful! I have never tried jerk but have always meant to. Now I will. And I am in complete agreement with you about both "the dreaded G" and that everyone should make their own spice blends, as those of us who are allergic to the dreaded G must. It is such a warming flavor, Jean - perfect as we leave the summer temps and head into late fall! I can't remember when I started calling it "the dreaded G," but it has stuck and, now, even my office mates call it that! That first para had me in fits of laughter. Lovely one, David. I've honestly never tried jerk before - it looks and sounds so good. 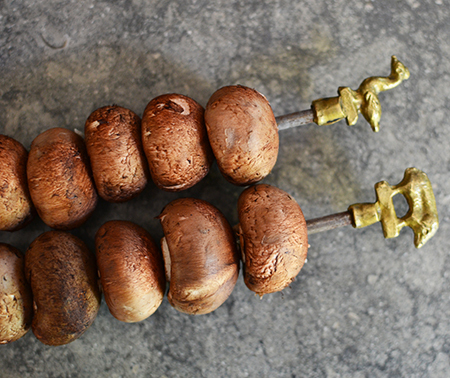 As for your mushrooms and peas cooked in rum ... now that sounds quite a fabulous plate! 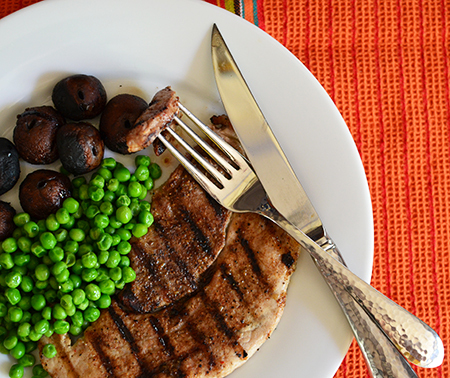 Honestly, Jill, I have no idea if mushrooms and peas are served with Jerk, but they worked for me, especially with the rum! David, Having lived in Kingston, Jamaica and traveled the entire island quite a few times, I know first-hand that there are many different recipes for jerk seasoning--some of which I loved and quite a few I did not care for. Still, I never thought of making my own jerk seasoning! Great idea! BTW, Port Antonio and the Blue Mountains and overall interior of Jamaica are vastly different from the tourist haunts--very appealing! That is great info about Jamaica, Susan - maybe someday we will get there! I love jerk seasoning but I've never made anything jerked myself! It's interesting to know exactly what goes into the spice blend. This sounds like something I need to try!